Material Design in phpBB in other way! 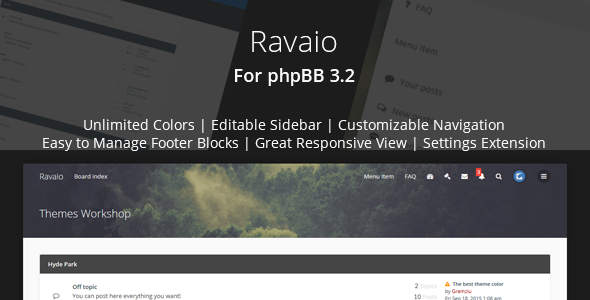 Ravaio – premium phpBB3.2 theme with perfect responsive design and a lot of customization options available without any coding knowledge. Customize theme colors, add items to your menus, sidebar, change overall layout just with few clicks! Retina ready with support for every resolution. LESS source available on request; fast way to create your own unique theme variant. All phpBB Official Extensions are supported. Some unofficial extensions are supported too. Want to know about support for other extensions? Just contact me via support tab. You can contact me using contact form on this theme support tab.